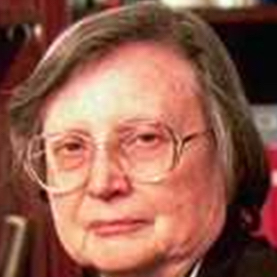 Eileen Haughey Searls, professor emerita of law and former director of the Omer Poos Law Library at Saint Louis University, passed away in Annapolis, Maryland, on January 6, 2019. She was 93 years old. Professor Searls joined the Saint Louis University law library faculty in 1952, after the school had reopened following World War II. She remained there until her retirement in 2000. During her career, she was an active mentor for young women attending law school. In the 1970s, she was known for hosting an annual dinner at her home for all women students and was an active role model to the Women’s Law Student Association. In 1995, Professor Searls established the McDonough/Immel Law Library Endowment, which provides fund for library staff for courses or educational programs related to information access or other topics to support the educational mission of the law school. As a professor emerita, she established the Eileen Searls Book Award in 2010 to support law school staff members continuing their education by contributing towards their book purchases, and established a separate award for law library student workers the following year. Professor Searls co-founded the Law Library Microform Consortium and Mid-America Law School Library Consortium. She was also the founding chair of the Council of Law Library Consortium, a chairman of the Conference of Law Libraries of the ASCU, and a member of the American Library Association, the American Association of law Libraries, and the British and Irish Association of Law Libraries. Professor Searls earned numerous awards throughout her career. She was named Woman of the Year by the Women’s Commission of Saint Louis University in 1987, was awarded the Marian Gould Gallagher Distinguished Service Award from the American Association of Law Libraries in 1999, and inducted into the AALL Hall of Fame in 2010. In 2015, she was inducted into the inaugural class of the SLU LAW order of the Fleur de Lis Hall of Fame, the school’s highest honor. A native of Madison Wisconsin, Professor Searls held a bachelor’s degree, a master of library science degree, and a law degree, all from the University of Wisconsin.